It’s been a seriously long time since I’ve been to a blogging event. Blame it on my crazy and unpredictable schedule, which doesn’t allow me to commit to much in advance. Or the fact that I’ve been trying to spend more time in the kitchen cooking myself. Or probably a combination of the two. But when we got an invite to Bruegger’s Bagels‘ 30th anniversary event, I didn’t even look at my schedule before agreeing to go. After all, I have a longtime obsession with Bruegger’s. AND the event was actually being held right down the street from where I live. A blogger event in Melrose? I’m can’t say no to that! So, let’s talk about my lifelong obsession with Bruegger’s for a minute. First of all, I grew up with it. I remember when Bruegger’s first opened in my hometown of Andover. I totally hung out there with my friends on half days when we were allowed to walk downtown after school. Everything bagel with garden veggie cream cheese all the time. Then my sister had a short stint working as a baker at Bruegger’s in the next town over when she was in high school. She got up super early and came home completely covered in flour. And learned the fine art of baking bagels. And then, starting in 2006, I spent 5 years working as a freelancer out of my home in Brookline. I bounced around between quite a few coffee shops, but almost always ended up at Bruegger’s. There was a huge variety of snack choices, the coffee was awesome, the staff was super nice, and they never kicked me out. My local Bruegger’s had what I like to call a “cast of characters,” a crowd that hung out there on a regular basis. I probably could have written a book about the clientele, but mostly I just enjoyed the fact that I could get my work done without being a complete hermit. And munch on bagels whenever my stomach started growling. 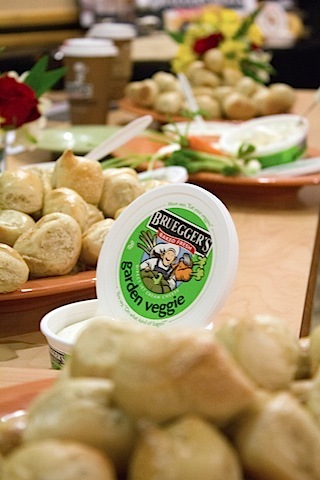 Tonight’s event in Melrose was in celebration of Bruegger’s 30th anniversary. 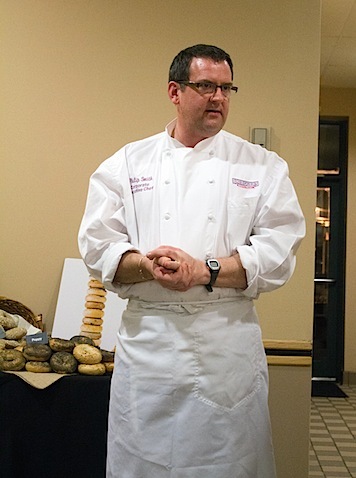 We got to hang out with Bruegger’s Corporate Chef, Philip Smith, who shared his passion for bagels with us. 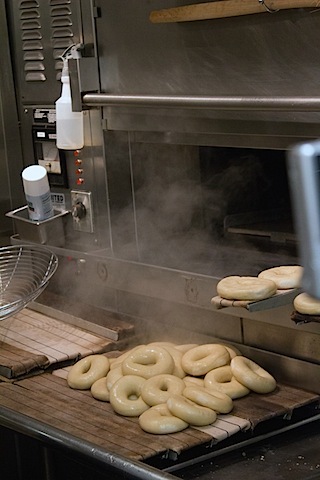 And we even got a firsthand account of the bagels being made. 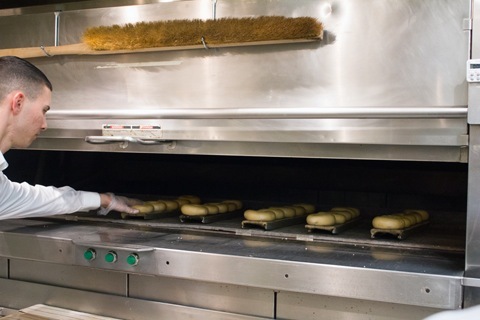 I love that you can actually see the bagels being boiled and baked when you visit a Bruegger’s! And I love the fact that it’s a very hands-on experience. John didn’t just throw the bagels in the oven and forget about them. 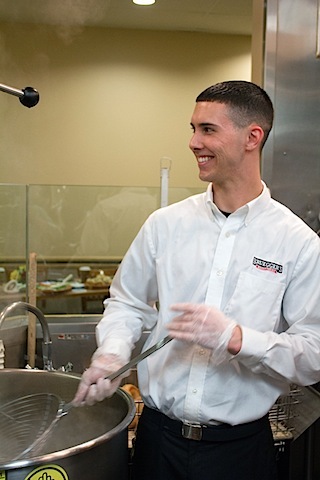 He showed us how much thought goes into the bagel-making process (not to mention he stuck is hand in a 400-something degree oven). 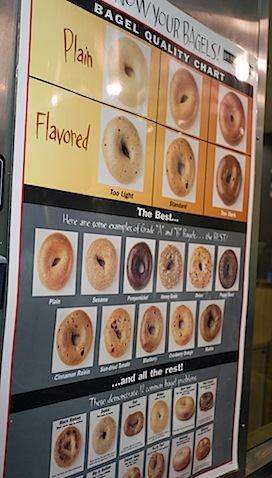 A bagel quality chart is available in case you want to make sure your handiwork is up to standards! And the cream cheese. Don’t even get me started on the cream cheese. Garden veggie is an all-time favorite of mine. But you can’t go wrong with honey walnut either. 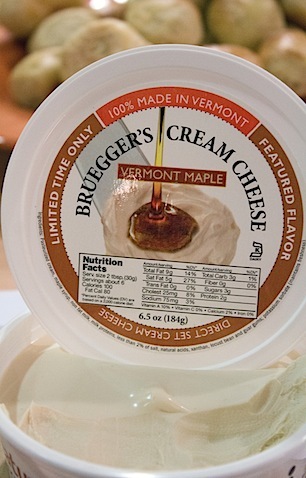 And this limited edition Vermont maple Cream Cheese? To die for!! 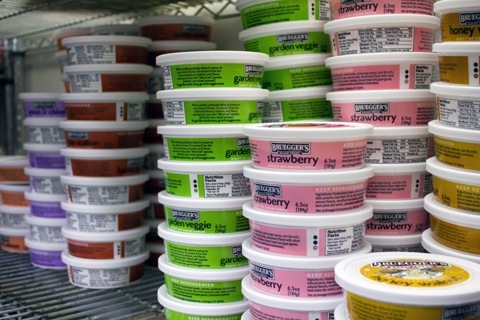 Bruegger’s cream cheese comes exclusively from Franklin Foods in Vermont. They’re coming out with a Greek cream cheese soon and I absolutely cannot wait for that! One of my favorite parts of the evening was getting to sample a PIPING hot bagel right out of the oven. Literally too hot to touch. But so awesome with a dab of cream cheese. I would like one of these delivered to my front door every morning, please! 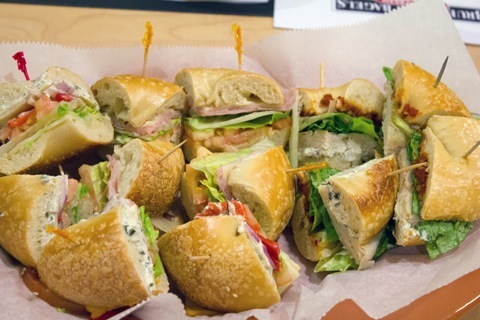 We also got to sample some of Bruegger’s signature sandwiches. I am no stranger to these, though I have to say I’m mainly a big fan of their egg sandwiches. And this? 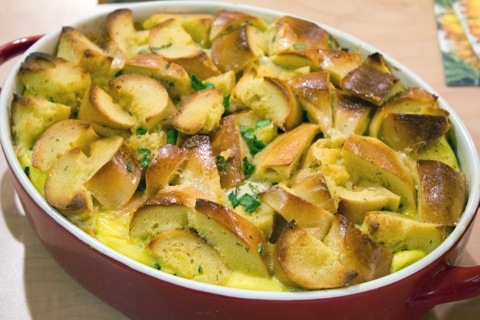 No, you won’t find this Smoked Salmon and Dill Strata on the menu at Bruegger’s, but it’s just one example of what you can whip up in the kitchen with a few bagels on hand. This was awesome because the bagels held up a lot better than bread would. And because you can make most of it the night before and pop it in the oven before your brunch guests arrived. 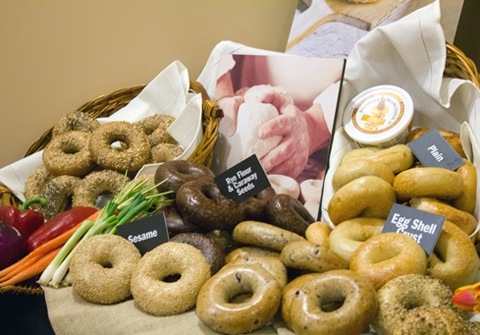 Bruegger’s has a lot of recipes on their website; dishes that involve a variety of bagels and cream cheeses. Like Chocolate Peppermint Cheese Cake? Yes, please!! 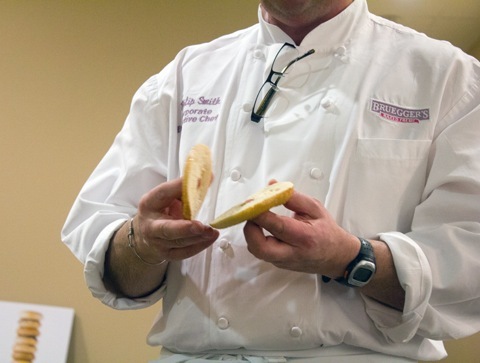 As someone with a passion for cooking, I was happy to hear Chef Smith talk about how much he and his team innovate. They spend a lot of time in the kitchen trying out new recipes and coming up with grand new ideas. And they truly care about using the best of ingredients, from the sesame seeds right down to the cinnamon. Oh, and if you order a cinnamon raisin bagel? You’ll get a raisin in every bite. Courtest of Chef Philip Smith! They even had a device created that makes a “skinny bagel!” Yup, it takes out the inside from a bagel. At first I thought, “huh, who the heck would want to do that? ?” But then I realized if you’re ordering a sandwich, it’s actually a good idea as it will be a bit more manageable to eat. And cuts down on 1/3 of the calories! I was SUPER excited to meet Michelle of The Economical Eater. We’ve been reading each other’s blogs and chatting on Twitter for what feels like forever and I couldn’t even believe this was my first time meeting her. 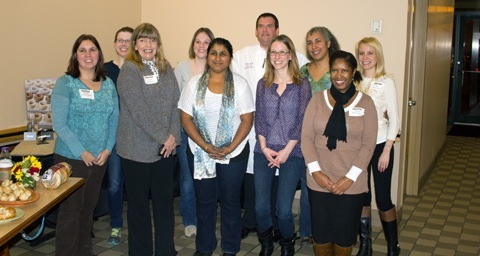 It was a great gang of bloggers, especially for a suburb-y event. And we were all thrilled to hear that all the leftover bagels from the evening’s event would be donated to a local organization! Well, except for the bags we took home. And I have to say Chris was quite excited to see a Jalapeño Cheddar bagel in there. Definitely a favorite in our home! 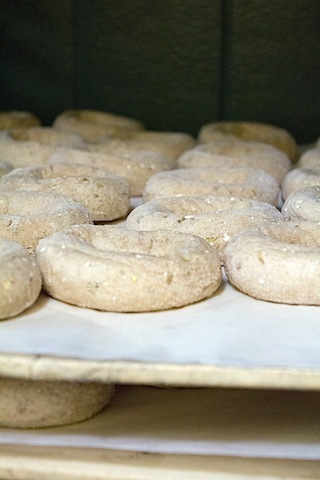 Are you a Bruegger’s fan? 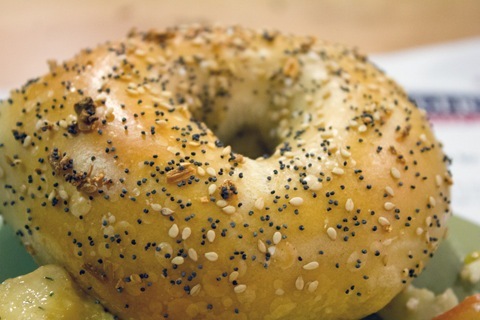 What’s your favorite bagel? Cream cheese? 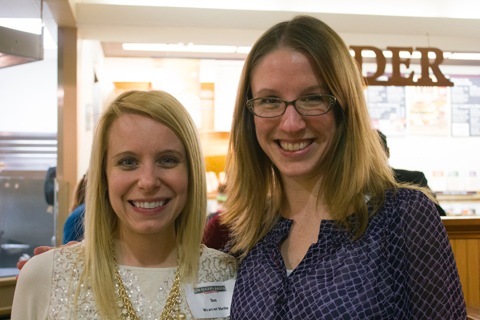 21 Responses to "Bruegger’s Bagels 30th Anniversary Boston Event"
So fun! They have the best bagels EVER! I miss their leonardo da veggie! I used to get it every day when I worked at Kabloom! I have the same memories as you of going to Brueggers on half days, and during lunch in high school when we were allowed to leave, it was only maybe a 3 minute drive. So useful! oh that does look like it was a fun and delicious event! I have a Brueggers near my office and never think to go! Now I want a bagel sandwich. Oh and I love your boots! I love brueggers! I have the bottomless coffee “membership” and have done it for years. I wouldn’t buy coffee daily so it isn’t really a savings, but it is a splurge that makes me so happy. French Toast coffee is my favorite. There are 3 locations downtown near my office! My husband and I recently got on a Bruegger’s kick. We both LOVE the rosemary olive oil bagels. It started to become a Saturday morning habit. Sadly I’ve had to go gluten-free and…nearly a month in, the cravings still haven’t gone away. 🙁 They have REALLY good bagels! 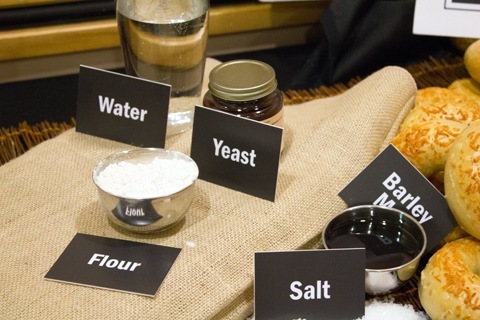 And I am smitten with the simple 5 ingredients — nothing artificial or questionable. Looks like a super event. I confess, I’ve never heard of Bruegger’s! They sure look good. This looks like the best event! I am obsessed with their maple cream cheese, they had it once a year or so ago and my office got it for a breakfast and I’d never seen it again since, but I would always tell people about it. I am so happy it’s back! It was so nice to finally meet you, too! And so glad you chose this picture over the other one hahaha. 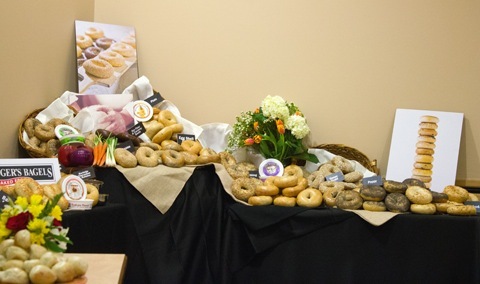 Such a fun event, although I’ve already plowed through a few of the bagels I took home…. I had no idea Brueggers was a chain for YEARS, until I went to school in Boston. I always assumed it was a Western Mass thing. You’ve got me craving bagels now, girl. Dangit! Bruegger’s is the best for bagels!! I could probably eat one every day. What a great event! Wow, what a fun event…such an awesome experience! These are by far my very favorite! 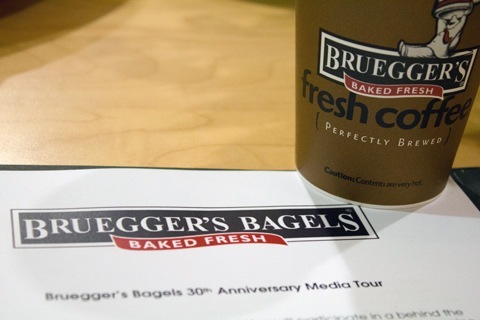 Happy 30th Anniversary, Bruegger’s Bagels…you are the BEST!! Sues, this event sounded fantastic! Yay for bagels!! Seriously, what an awesome event! I would have dropped everything for this. 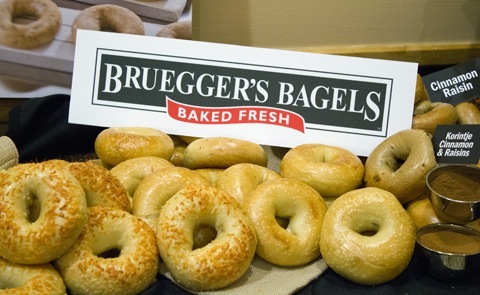 We don’t have Bruegger’s where I live now but I used to live within walking distance to one – love the everything bagels too w/ strawberry cream cheese! Yum! This event is totally my idea of heaven. I grew up with a Bruggers really near to my high school, and I ate there probably too often. Honey Walnut cream cheese has my heart, so so good!